All of the pages included in this template, EXCEPT this one, are meant to represent pages that could be developed by a learner in the College of Business at CSUMB, as a Learning Portfolio, for learning more deeply while completing the necessary coursework, to earn a B.S. in Business Administration. A WordPress blog site is an excellent vehicle for developing a Learning Portfolio because the context allows for the Learning Portfolio’s three most important elements: collection of artifacts for evidence of learning, reflection about learning, and feedback from others, such as mentors, peers, and professors. Many believe that the reflection component in Learning Portfolio development is the most important element contributing to the integrative potential of Learning Portfolio development. Additionally, Darren Cambridge of George Mason University, suggests that two kinds of reflective activities are critical for deep integrative learning, those related to what he calls the networked self, and those related to the symphonic self. From this perspective, the networked self participates in frequent, day-to-day reflections, making intentional connections across boundaries such as those between courses and groups, developing new relationships and new knowledge. But this level of reflection does not integrate these new connections into a cohesive view of the self. That is the role of the symphonic self. The symphonic self needs time and space for summative reflections, observing patterns, themes, and values from its work, synthesizing an integrated view of the whole person. (Cambridge, D., Cambridge, B., Yancey, K.B.,2009,p. 41-49). A WordPress blog allows for workspace for frequent reflections related to particular assignments and courses, through the development of blog posts, linked to specific, collected artifacts. At the same time, the WordPress structure allows for the development of more “static” pages, which can showcase the discoveries made by the reflections of the symphonic self. Pages, posts, and artifacts can be linked in any manner desired by the author, to communicate meaning. 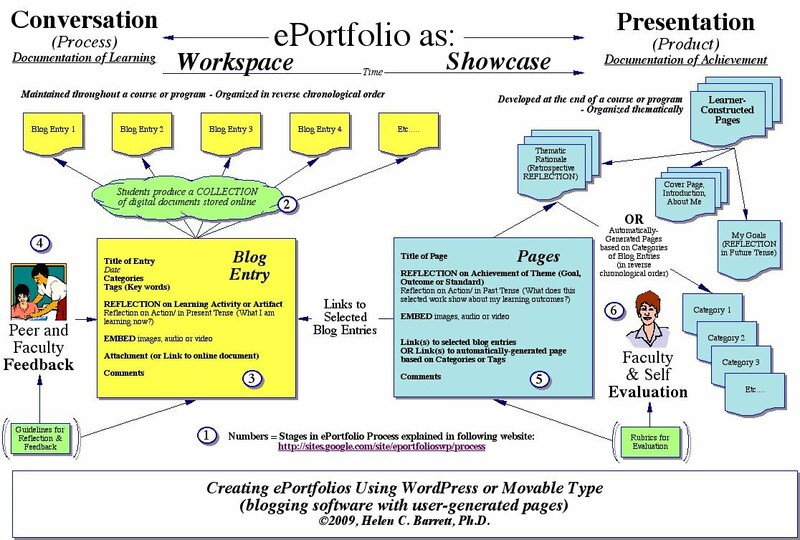 The following diagram illustrates using WordPress for both the workspace and the showcase aspects of a robust Learning Portfolio. This template was developed as an example of applying the configuration in the companion illustration to developing a Learning Portfolio for use across the Business Major at CSUMB. The goal is for faculty and learners to use this Learning Portfolio vehicle. Faculty can develop reflective assignments integral to coursework that also develop relevant portions of a learner’s Learning Portfolio. Faculty and peers can provide ongoing feedback on both pages and posts. The Showcase elements, in this template are the About Me pages, General Knowledge Outcome pages, and Major Learning Outcomes pages. These pages will include reflections developing the themes of each page, including links to relevant rubrics and learning experiences reflected upon in posts. Your Workspace elements will be the posts developed as learners reflect about particular learning activities and artifacts, while completing various courses in their program of study. A reflection will usually link to one or more particular artifacts showing evidence of a particular learning experience, such as a paper or presentation developed for a particular project. Relevant documents and images for use or attachment in posts and pages may be uploaded to the media library. External websites holding artifacts, such as videos in YouTube, may also be linked. These instructions may help you begin your own Learning Portfolio using WordPress. Note to Faculty: Suggestions for Implementing a Portfolio Process across our Business Program and for using Learning Portfolios as integral elements of coursework are published in a companion site. Note: The graphic illustrating effective management of content through WordPress capabilities is available on a website developed for educators by Helen Barrett, PhD. You may enjoy reviewing her experimental WordPress site as well as further content on her ePortfolios with WordPress site. Further suggestions to educators, from Dr. Barrett, related to using WordPress as a Learning Portfolio vehicle, are summarized here. Cambridge, D., Cambridge, B., Yancey, K.B., (Eds.). (2009). Electronic Portfolios 2.0: Emergent Research on Implementation and Impact. Sterling: Stylus Publishing, LLC.